Green Tara, the 'Liberator or Saviouress', is the principal female bodhisattva of compassion and the 'Mother of all the Buddhas'. She protects all beings from the eight great fears of samsara or cyclic existence: fire (anger); floods (attachment); lions (pride); elephants (ignorance); imprisonment (greed); snakes (jealousy); demons (doubt), and thieves (false views). 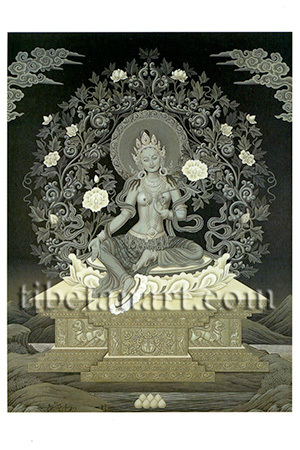 Tara is peaceful and attractive, as youthful as a sixteen-year-old, and her beautiful body is adorned with all manner of divine silk, jewel and pearl ornaments. She sits upon a white moon disc, an open lotus and an ornate lion-throne in the posture of royal-ease, with her right foot resting upon a small lotus pedestal. With her extended right hand she makes the gesture of generosity, granting boons to all beings. With her left hand she makes the gesture of protection or giving refuge in front of her heart, with her thumb and ring finger holding the stem of an immaculate lotus that blossoms at the level of her ear. She appears within a nocturnal landscape, and her beautiful aura is fashioned from a symmetrical pair of scrolling jewel crests, which are entwined with a profusion of lotus flowers, leaves and tendrils.